I just learned that February is Women in Horror Month, which lines up perfectly for me, since I spent much of the month reading horror novels. My treat to myself on our week-long field trip to the coffee zone was to read Stephen King's Doctor Sleep (I usually only read young adult and middle grades books during the academic year), which stars a gifted and powerful little girl. Following that, I got into Jonathan Maberry's Rot & Ruin series, with its enigmatic Lilah the Lost Girl and likable Nix Riley. 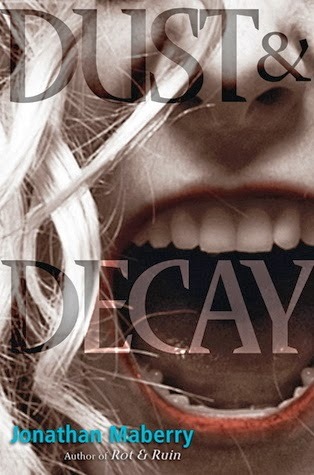 I finished the month with the second novel in the series, Dust & Decay. It is rare for me to enjoy the second book in a series more than the Dust & Decay takes everything I enjoyed about its predecessor and ramps it up a notch. The action and fights are more frequent and intense, we already know the characters and some of the bounty hunters only mentioned before are now central characters, and the zombies are more frightening. To use a pun, this series is infectious. My dog's foot got tangled in my hair as I slept and my dream became about zombies. I spend a lot of time thinking about zombie escape plans. And I'm as curious as the characters in the books to find out why the zombies are suddenly acting differently. There are some plot points that I strongly dislike, but I am now a devoted fan of Jonathan Maberry and have faith that he is taking his readers somewhere exceptional.